The Sussex batsman has been included in a 13-man squad for the final game of the Specsavers County Championship campaign against Northamptonshire at Northampton, starting on Monday (10.30am). Evans was instrumental in Sussex’s run to the final of the Vitality T20 Blast, finishing as the competition’s top scorer with 614 runs. On Friday Evans was named Limited Overs Player of the Season when the annual awards were presented after the final home match against Warwickshire. The 30-year-old hasn’t played in a first-class game since pre-season and if he were selected it would be his first Championship appearance of the season. Evans comes in for Tom Haines, who injured his ankle against Warwickshire last week – a game which finished in a draw and consigned Sussex to a fourth season in Division Two. Despite coming up short in the promotion race Head coach Jason Gillespie insists the positives outweigh the disappointment of failing to secure a place in the top flight. “We’re moving in the right direction,” said Gillespie. “We’ve had a couple of losses in the past month but we feel some progress has been made. “I wanted to give some young guys the opportunity to show what they can do and they’ve done that. Now I’ve got to find the balance between giving lads games of cricket and earning the right to play first-class cricket. Evans’ selection is one of two changes to the squad. 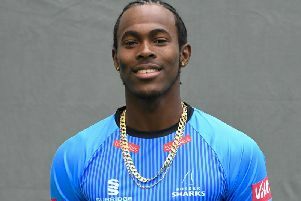 Jofra Archer has been rested so there is a call-up for Abi Sakande, a day after the right-armer celebrated his 24th birthday. Skipper Ben Brown says his side are keen to finish the season strongly. They need two points to guarantee third place behind Warwickshire and Kent, who meet in a title decider at Edgbaston. Brown said: “Last week was disappointing but I feel we’ve made massive strides this season, it’s just a shame that we lost a couple of key games this month which have cost us. Wantage Road isn’t a happy hunting ground for Sussex, who haven’t won a Championship game at Northampton since 1994.